A lovely story that instantly makes you want to go to Denmark and experience this phenomenon of Hygge. Well written and great observation. Enjoyed the love story as told by the protagonist. I felt I really knew her and was rooting for her every step of the way. Good pace and interesting characters. Easy read. Really enjoyed this story. The characters are a great mix of entertainment. A story of ups and downs and fun. Made me want to visit Copenhagen. A book which is based on the happiest people on Earth, the Danish and their concept of a lifestyle Hygge. It is all about making your life better, making life cozy, through little things, bringing warmth and homeliness. That's why they are the happiest people on this earth. 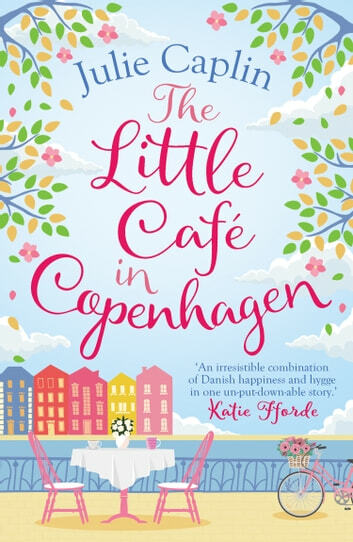 After being betrayed by her colleague and lover, Kate has to take 6 journalists to Copenhagen at the behest of a client of their PR firm to show them the concept of Hygge. And enter Ben a journalist but an unknown Prince Charming to Kate's Cinderella act, at an awards night a few nights ago. The chemistry between them is sizzling, their banter invigorating, and yes obviously, love happens!! But that is much later. My first book by Julie Caplin, and I am absolutely enthralled and captured by Julie's way of writing. The book had a great camaraderie where the journalists start as strangers then go on to become a tight-knit group.The dynamics of the group with their skirmishes and their plans, made my heart smile with joy at the beauty of it. I loved seeing Copenhagen via the author Julie's eyes, and every description sang its beauty to me. Copenhagen is my place to visit in this lifetime, thanks to the author. The warmth in the book, struck me deep in the cockles of my heart. I smiled with the characters, their antics, their friendship, their love for each other lasts even after leaving Copenhagen. The main character Kate is a sight to behold, who grows as the chapters unfold, and in the end, her insight and confidence is what is left with me, to remember and to encapsulate. After reading this book, the concept of Hygge is so vivid and memorable, that I couldn't help but embrace it in my home. 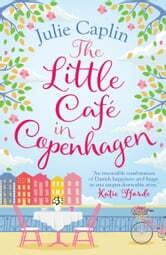 I know this book is fiction, but I sure would like to visit The Little Cafe in Copenhagen. This is not a romantic book per se, but it is a book of friendship. (But I fell in love both with the author, Julie Caplin and Copenhagen) I would say the entire book is Hygge, as strangers becoming friends, then soon becoming a family of sorts, is both heartwarming and beautiful. What is this, if not Hygge??? The Little Café in Copenhagen is a gentle and warm read, almost hygglich itself. I don't read a lot of contemporary novels, so it takes something special to keep my interest. And that is exactly what this gem of a book did from the very beginning. Kate is a woman who has convinced herself that she is doing the right thing, in all areas of her life. She thinks she is in line for a promotion, and honestly can't think of anything better. Of course, when she doesn't get it, but is offered a conciliatory bone instead - a bone that no one else wanted - she grabs it with both hands, determined to make the best of a bad situation. With an eclectic cast of characters, this book gels together in a way that keeps you turning the pages. They all have their secrets to share (all apart from one) and Eva manages to get them to spill the beans in an almost magical way. There was nothing about this book that I didn't like! The writing style was smooth and witty in all the right places. The scenes flowed from one to the next, and I loved how it was split into three different sections. There were no editing or grammatical errors that disrupted my reading flow. I loved every word, and can't wait to continue with this series. Absolutely recommended by me. * A copy of this book was provided to me with no requirements for a review. I voluntarily read this book, and my comments here are my honest opinion. * Merissa Archaeolibrarian - I Dig Good Books!